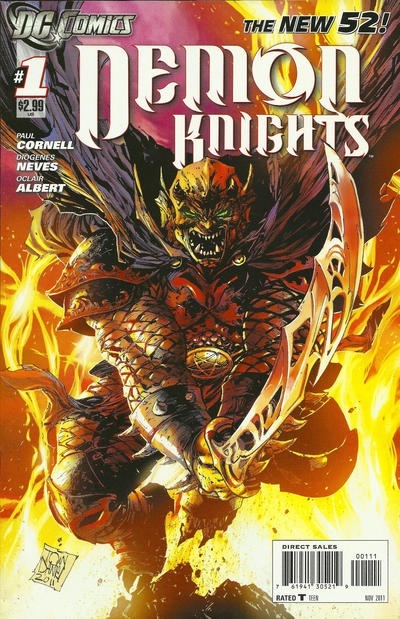 If you like magic, mysticism, and monsters then you should be reading Demon Knights, a New 52 title by DC Comics. 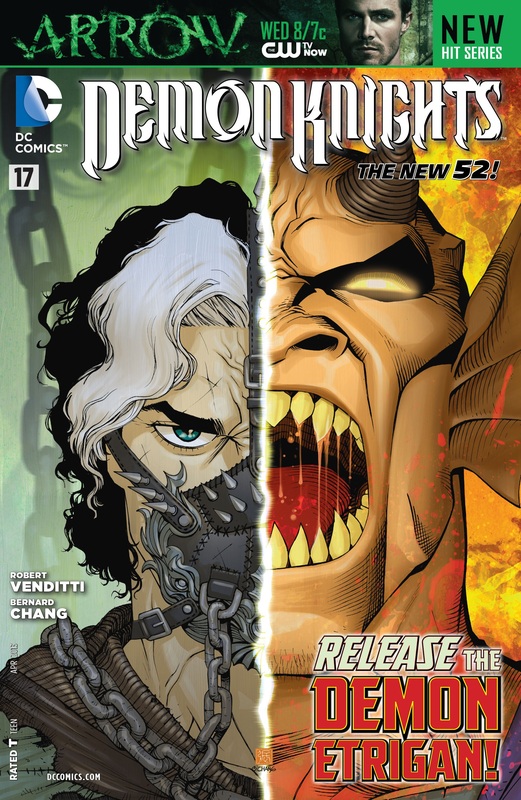 The series is currently on issue #17. Etrigan – Demon from Hell. Hates everyone. Tried to overturn Lucifer and his army. Wants to put an end to Merlin and Jason Blood. Jason Blood – Former apprentice of Merlin. Soul bound to Etrigan’s by Merlin during the destruction of Camelot. They share bodies and can change at will. Madame Xanadu – Magician trained by Merlin. Lover of Jason Blood and Etrigan. Exoristos – An Amazon living in exile. Shining Knight (aka Sir Ystin) – Transgendered knight. Horsewoman – Mysterious. Skilled archer. Ability to communicate with horses. She can’t walk but can ride a horse, supported by the magic in her saddle. Al Jabr – Has advanced scientific knowledge. Inventor. Little is known about him but he can build war machines and electrocute people. Vandal Savage – Barbarian. Rowdy, deceitful. The series takes place in the medieval times within the DC Universe. The team happened to meet by chance in a small village. They joined forces to stop the Questing Queen and her horde from destroying the village. The series is well-written by Cornell. There’s plenty of jokes and all the characters are compelling. I love the interactions among all the characters. It’s hard for me to have a favorite because each character is different and have their own quirks. The artwork, by Diogenes Neves and Oclair Albert, is excellent. Finely detailed. These two artists are great at visual storytelling. Flawlessly flowing panels. Robert Venditti took over as writer beginning with issue #16, where he begins his story 30 years later. Venditti’s writing is that of Cornell’s. Well written. Bernard Chang did a great job with the art. The Demon Knights went their separate ways after the Battle at Avalon. Al Jabr has summoned the knights to stop a plague that is quickly spreading by a man known only known as Cain. Cain and his guide, an Amazon, infects people through their bites. Yes they are VAMPIRES. Al Jabr is unable to join the team because of his aging body. He’s not immortal like the rest of the team. Horsewoman, Exoristos and Shining Knight agree to stop Cain and his recruits. Needing Etrigan for his strength, the trio must first free him from Vandal Savage’s imprisonment. Demon Knights is a must read series. It’s full of sorcery, dark magic, witches, monsters, and demons. Oops, I told my verdict two sentences up, didn’t I? Oh well I’ll say it again. DEMON KNIGHTS IS A MUST READ SERIES.